When someone tells you they are a teacher or a nurse, you pretty much know immediately what they do and how they earn a living doing it. But when I tell someone that I am a blogger, they usually give me this quizzical look and ask “But, how do you get paid to be a blogger?” I love explaining my non-traditional job to folks, so today I thought I’d spill my secrets about exactly how I earn money as a full-time blogger. Think of a blog like a mini-magazine, except you (the reader) do not have to pay a dime to read it. It comes to you free of charge via Pinterest or facebook or straight to your inbox if you subscribe to my posts. 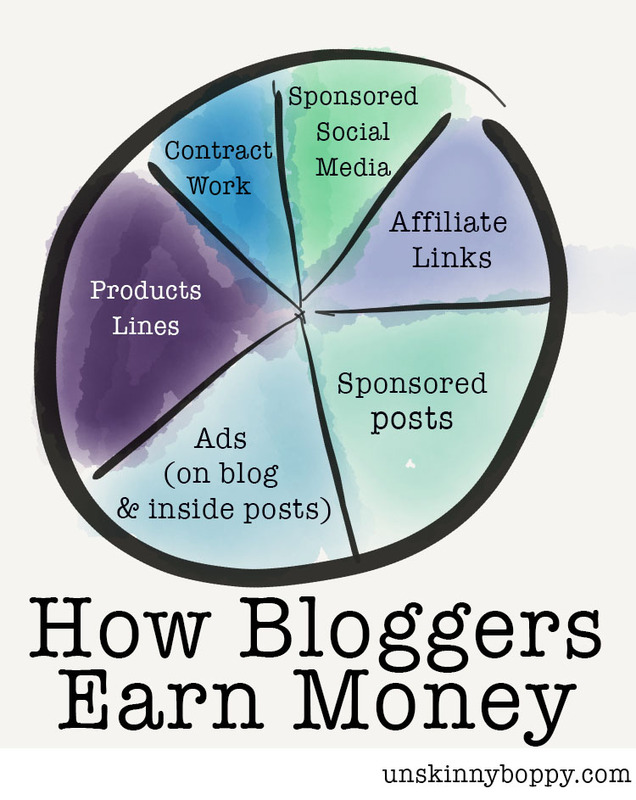 Bloggers earn money in a variety of ways, so I’ve drawn this handy little chart to show you how I make money from my blog. Ads are pretty straightforward. You see them plastered all over the sidebar and header of my blog and a few scattered inside of my posts. If you click those ads, I get money from that click. If you don’t click those ads, I still get money just based on the number of impressions (basically, eyeballs) that see my ads each month. I have an ad network called Adthrive that manages all of my ads for me, so I don’t touch this part of my blog other than to tell them where to send my check. In the olden days before Adthrive, I struggled HEAVILY in this department. There was even a point in time when I was “proudly ad-free” but nope. That flew out the window when I learned that if I wanted to make full-time money on this blog, ads were a very large chunk of that pie. Now it’s just easy, passive income each month. Sponsored Posts are woven throughout my blog content sporadically. You’ll always know that it’s a sponsored post because I put a disclaimer inside each one that tells you I got paid to write the post. The FTC requires that we do this, so if you see a blogger not putting disclaimers on their sponsored posts, feel free to call them out on it. I try my VERY best to make my sponsored content entertaining and relevant to you, my readers. I say “no” to sponsors way, WAY more often than I say “yes”. I do not take just any ol’ offer that comes my way. I weigh out the value of what it will bring to you as a reader, what service I can provide for each brand and how much it will help me in the long run. Sometimes I reach out to brands and ask if they will sponsor a post, but usually they pitch me in an email and we start negotiations from there. I send them my media kit, show them my numbers for online influence and quote them my price for the post. Everything is negotiable and a la carte. Over the years my prices have risen dramatically because I am finally realizing my value as a content creator and social media swayer. I have a well-established blog with good content, a very large Pinterest following and a decent community on facebook & instagram. I care about my blog readers and I refuse to write something that makes me feel icky inside just for the paycheck. Because of that trust I’ve built up over the years, I feel like you are all my BFFs sitting around my living room. If I’m going to tell you about something awesome I discovered to make my life easier, I’ll do it. And I hope you trust me enough to buy it if it is something you need. That is called online word-of-mouth marketing, and it’s HUGE. And brands know it (or they are quickly learning). So, if I am going to write a sponsored post, it is not going to be for free these days. Well, I take that back. I have been known to work for free product only if the product value meets or exceeds what I would charge for a post. If it’s just a small product that I want to mention (or rave about) without all the hassle of a full sponsored post, then I would link it up using an affiliate link. Here is my Amazon affiliate link if you feel like giving me a little Christmas bonus when you do your shopping this year. 🙂 As soon as you click that link and make any purchase, I will earn a little bit of money. It’s that simple. Now, Amazon is just one affiliate program– there are millions of other affiliate programs out there and I try my best to link them up judiciously without being spammy for you as a reader. There are affiliate networks like Commission Junction, Share-a-Sale and RewardStyle where bloggers are making BANK from affiliate links on social media. I am not one of those bloggers, but it is possible to earn a lot of money through affiliates. I really need to up my affiliate game, but it’s quite a bit of work, and I am lazy…so yeah. Once again, the FTC says that I am always supposed to disclose that I am about to send you to an affiliate link, so usually you’ll see something like aff link, “my link” or (affiliate) near the link. Sponsored Social Media is in a different category from sponsored posts because brands might just pay for a few tweets, Facebook posts or Instagram mentions. Pinterest is a little trickier, because it is against their policy to get paid per pin and until recently they would strip out affiliate links. Snapchat is taking over these days but I just stick with the old school social media. This dog is too old for new tricks. Sponsored social media has grown lately with the rise of the Instagram fashion/makeup micro-bloggers. These days there are teenage girls who earn thousands of dollars from a single Instagram selfie, because they have a huge following who will buy the products they are wearing or using in the photo. I am not a teenage girl and I do not have a huge IG following, but I do charge a brand if they want a shoutout from me in social media. My selfies aren’t worth quite as much as those bikini-boppers, though. Contract Work is exactly what it sounds like. I will contract with a brand to do work for them. Over the years I have contracted with True Value Hardware, Mohawk Home and eBay, to name a few. Sometimes that means I write posts for their website and drive traffic to them and sometimes it means I sign a contract to write a set number of sponsored posts on my blog and link to them. A local magazine, B-Metro, pays me to go out “on-location” (sort of like a radio DJ) and do remote social media promotions for them at the Birmingham Parade of Homes and Home and Garden/ Builder’s shows. Those are always fun, so I do that several times a year if our schedules jive. Currently I am contract-free, but that is subject to change each quarter. I love being an eBay influencer, so I usually sign a contract with them whenever I am able to make the time to work with them. Not gonna lie, contracts are usually a LOT of hard work, but they pay well. I try really hard not to overload myself though. Another example that would fall in the ‘product line’ category would be my Young Living sales. I attribute a lot of my success with my Young Living essential oil business to my blog, because I can reach audiences sitting in their living room all over the world instead of depending on my local friends and family to drive sales. I am a Silver with Young Living, which is a substantial part of my monthly income. Lots of bloggers have found success with various direct sales companies, mine just happens to be essential oils. I am an affiliate for several of my blog friend’s products lines, so I would earn a referral bonus when I help them make a sale. The Genius Blogger’s Toolkit from Ultimate Bundles is a good example of this affiliate/product money-making combination. 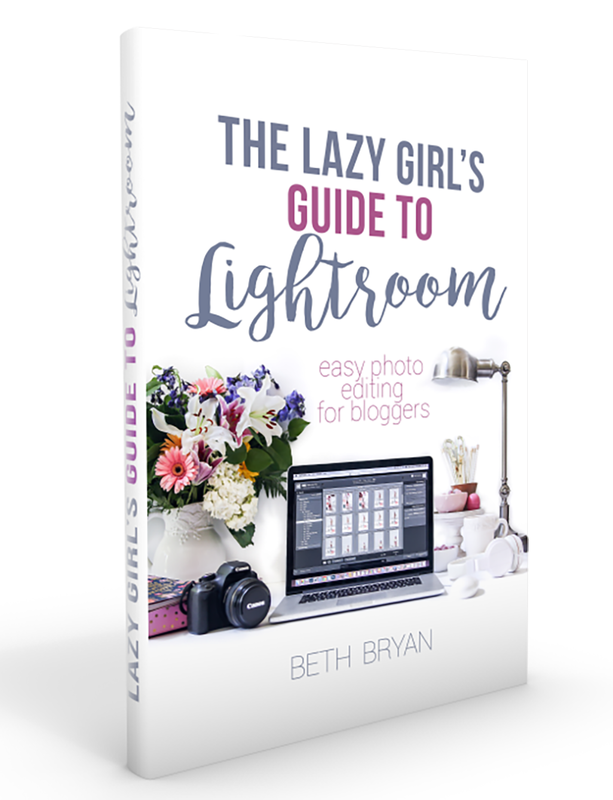 I have a whole bunch of blog buddies who are offering their e-books and e-workshops as part of this limited time bundle, so it’s a no-brainer for me to recommend this product to all of y’all who have toyed with the idea of starting a blog. There is a TON of excellent resources in there and it’s only available for a few more days, so get it before it’s gone. Magazines and Photography: Over the years I have contributed articles and photos to quite a few magazines, and I do get paid for those contributions. I charge a reprint fee if they are using my photography and a higher rate if I write the article and provide photos. It’s not a huge amount, but every little bit helps. Speaking gigs: I personally have never been paid (yet) for any speaking gigs that I’ve done at conferences or events, but I have turned down some paying gigs (at my local Home and Garden Show) because I was too busy to do them. Maybe in the future. So, there ya go! That’s an insider look at the major ways I make money here on this old blog. It’s taken me many years to learn my worth as an online influencer and content creator, but I feel like I’ve found my stride. My hope is that other bloggers will know their worth as well. I plan to ride this train for as long as I’m able. I am SO grateful that this is my job. There are days I feel like I should pinch myself because it’s so hard to believe this is a real thing. If you have a minute, 60 Minutes just did a story about the new wave of online influencers. It’s worth a watch, if you’re interested. I’m not Kim Kardashian, obviously, but it shows you how this industry has evolved in the past few years. Young House Love also has a great podcast talking about how much bloggers charge for sponsored posts that’s worth a listen, if you are searching for more info on this topic! If you are a blogger, do you agree with this list? Am I forgetting something? How do you make money? « I’m Not a Player, I Just Blog a Lot. Haha I love your honesty about Snap (Snapchat) – same here! I had a brand ask me to do a series on there and I’m like, “Here’s the name of another blogger – you’ll get more than your money’s worth.” This dog is definitely too old for that!! ? And did you see where Vine is going under as we speak? So glad I didn’t put my eggs in that basket. I predict Periscope will be next. Facebook live rules the world now. Amen, sister. I try to diversify as much as possible, so when everyone starts freaking out about an algorithm change on (insert social media platform here) I am over here like, Meh…. I’ve been doing this for so long now that I am spread far and wide. And yes! Go for it on the product creation. It was a LOT of work but so worth it!